How did the ethnographic collections of German explorers come about in the nineteenth and twentieth centuries? 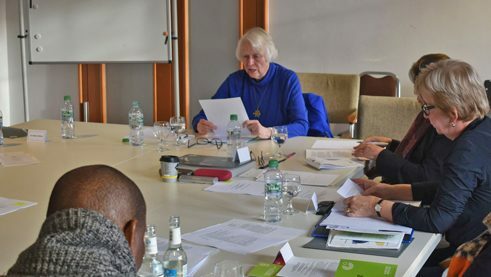 Insights into historical archives were provided by ethnologist Dr Beatrix Heintze, who has been researching them at the Goethe University Frankfurt since the 1960s. Important ethnographic Angola collections in Berlin and Luanda were created under colonialism between the 1930s and 1950s for the Ethnologisches Museum and for the Museu do Dundo in northeastern Angola. 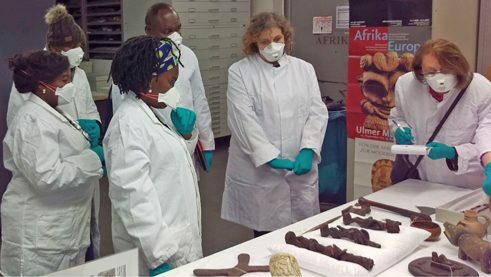 Today their objects form a large part of the collection of the Museu Nacional de Antropologia in Luanda. The Ethnologisches Museum Berlin houses one of the world’s most important and oldest collections of Angolan art and material culture. Beatrix Heintze explained the mutual research tradition | Photo: Goethe-Institut Angola What anthropological work are the museums in Angola doing? 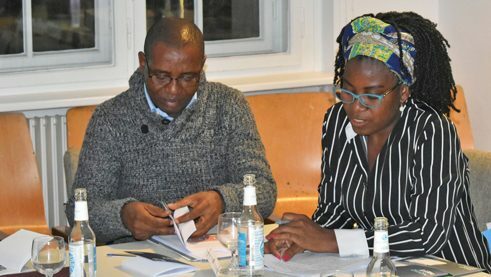 Dr Ziva Domingos, head of the National Museums in Angola, presented projects, museums and universities of Angola working in the field of anthropology. She also dealt with the challenges faced by museums in Angola, including the training of staff, the preservation of collections and museum publicity. Álvaro Jorge and Engrácia Manuel Agostinho de Oliveira reported on the collection of the Museu Nacional de Antropologia, whose first exhibition was opened in 1976. The museum houses around 6,000 objects. Álvaro Jorge and Engrácia de Oliveira presented the Museu Nacional de Antropologia | Photo: Goethe-Institut Angola Kristin Weber-Sinn from the Ethnologisches Museum Berlin gave insights into an exchange project between Tanzania and Germany, which aims to research the “biographies” of the objects. The restorer Eva Ritz then invited the group to a guided tour of the museum’s depot. They focused on the objects from Angola and the professional exchange began immediately. The required protective clothing proved to be somewhat awkward, but also provided some laughter. How are objects restored and preserved in tropical climates? There was an exchange between the experts followed by a visit to the Berlin restoration workshop. 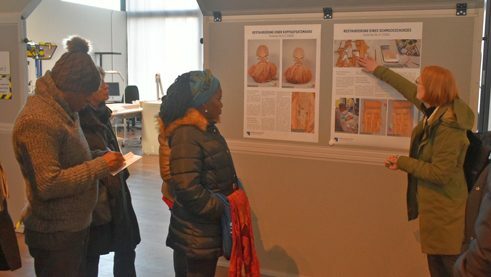 Eva Ritz explained the conservation techniques in the Ethnologisches Museum and made suggestions that could also be utilised in Luanda. How can the colonial heritage be reappraised in an international cultural dialogue? Dr Andrea Zell, who works on the subject at the Goethe-Institut Head Office, reported on the artistic disputes on the topic. Afterwards, the group visited the Restless Times exhibition in the Gropius-Bau in order to gain an insight into current approaches to exhibition design in Germany. The day ended with a visit to the Konzerthaus Berlin. After a city tour through the centre of Berlin, the delegation got to know one of Germany’s major cultural projects, the Humboldt Forum. From 2019, non-European collections, including important objects from Angola, will be exhibited in the reconstructed Berlin Palace. The “Humboldt-Box” and the exhibition Humboldt Forum Highlights provide initial insights with objects from the collections on the Museum Island, where the Angolan experts were introduced to the project. One of the highlights was the visit to the Bode Museum where European and African objects are presently being shown side by side. Among them is one of the best-known works of African art from the Angolan collection: the iconic sculpture of the cultural hero Chibinda Ilunga, considered the founder of the kingdoms of Lunda and Chokwe. The experts from Germany and Angola also discussed several other pieces of the exhibition Beyond Compare: Art from Africa in the Bode-Museum, including the throne of a Chokwe chief. What do the partners hope for, what are their prospects? Moving towards an action plan, the partners discussed the objectives of their collaboration. For the first year, they agreed to share information on the collections of both museums, to conduct a workshop on preservation and restoration, and to translate important historical, ethnographic documents into Portuguese. 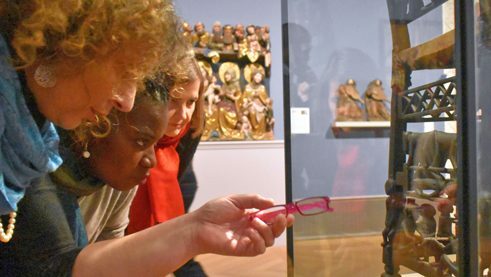 Together with members of the societies of the objects’ origins, artists from Angola and Germany will also develop a project on the history of the collections and their objects. The directorate of the Angolan National Museums, the Prussian Cultural Heritage Foundation and the Goethe-Institut have agreed on a longer-term cooperation in Luanda: Hermann Parzinger, president of the Prussian Cultural Heritage Foundation, Norbert Spitz, director of Sub-Saharan Africa region at the Goethe-Institut, and Ziva Domingos, director of the Angolan National Museums, signed a Memorandum of Understanding in the Angolan capital city.